In the previous post, I did say about my anticipation for a good news regarding the placement to school. I was - or should I say 'am' because I'm still hoping at the moment - hoping that the good news will come soon. In January to be exact. And today, while doing my current daily routine of browsing through my twitter page, something caught my attention. Is this a good omen? Forget about the first few sentences. This particular one caught my attention: "B.Ed Tesl graduates (both graduated in June & Nov 2012 *typo? 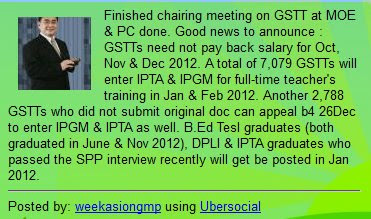 *, DPLI & IPTA graduates who passed the SPP interview recently will get be posted in Jan 2012"
Whatever it is, I hope what everyone's being hoping/praying for all these while will soon become reality. And yes, I also hope I pass the SPP interview. It's the prerequisite requirement before I get to be posted to school. And as for now, I'm just hoping for the best. Just wait and see. The time will come. Sooner or later. Joshua had lived an amazing life even though it was rather short. He was a great friend; he was the kind of friend that stands by you when you need somebody to be there. What is it that we remember when we think of Joshua? I think everyone who knows him very well would agree with me on this. It was his sense of humor. He was the kind of person that would make everyone laugh so hard that they’d end up crying. Who could forget about his jokes? How about all his games during every gathering? Goodness! Just thinking about those jokes/games still make me laugh. Joshua's departure was sudden. I remember when I heard the news I simply could not believe it. He was too young but as it slowly occurred to me I have realized that he indeed lived his life wonderfully. He was well-loved and he had done so many things on earth and I’m sure he’ll do much more in heaven. All the memories I have shared with him will forever be cherished and remembered. Joshua will forever live in in our heart. The title of this post speaks it all - I'm going to share with you my experience during that important interview. Well, it all started on that one particular fine day when I logged on to Facebook and I saw a tiny red box on that notifications button on the top left hand corner of the page. So, I clicked on it and was then directed to a group's page - a group page that belongs to the at-the-moment-unemployed creatures of the earth a.k.a TESL graduates of 2011. There, I saw a post saying that the status for the interview can be accessed by us starting on that day onwards. Yours truly then clicked the link provided in the post and a page popped out. The page required me to fill in my IC number. So, after filling my IC number, the page appeared and it didn't show me the expected result. Yeah. My name was not in the record. I didn't feel bad about because I was confident enough that the information will be updated sooner or later and my name will appear in the system. On the next day, I checked the page again and as expected, my name's already in the system. The interview date for me was set on the 23rd November 2011 at SPP (Wisma BSN, Kota Kinabalu). Call time was stated as 7.30 am. From that day onwards, the group page was filled with so-called notes for all of us to read as preparation for the upcoming interview and all of a sudden, life (for most of us who are still jobless) became 'meaningful' again. LMAO! People started discussing on various topics mostly on the so-called hot topics (i.e. MBMMBI, NKRA etc). I consulted one of my friends who had attended the interview earlier this year and asked him to share his experience. He told me that his interview session was more like a 'sharing' session and of course he was asked about theoretical items, policies and whatnot. As the day's approaching, I get a little bit nervous as I knew I couldn't 'digest' all those fact into my memory. I'm not really good at memorizing things but exceptions should be given to song lyrics though! :) Anyway, I did prepare myself by forcing myself to read the notes that I got from the Internet. Finally, the most awaited day arrived. I woke up as early as 5 in the morning. Before leaving for the interview, I checked all my documents for the very last time just to make sure everything's ready in that file and well-sorted. I left the house at about 6.30 am and drove mom to work first before heading to Wisma BSN. Once I reached there, I saw few people smartly dressed waiting at the entrance. So, after I parked my car, I walked towards the entrance and met few familiar faces. Had a little chit-chat with them. It was probably about 7 in the morning, a lady asked to go upstairs. To cut the story short, before the interview started, everyone had to consult the lady the counter for a brief documents check-up. It was just to make sure that all the documents are ready for the interview. Everyone was also divided into few groups: five persons per session. I was in the 2nd group. The four of us were all from TESL background and the other one was from the Arts option (DPLI). The five of us were extremely nervous and waited for the question. Suddenly, the interviewer took a newspaper from the table and showed us the health section. The article was about SMOKING and then the interviewer asked us 'How to EDUCATE students on curbing the smoking habit'. All of us smiled. So, the Q&A began and I decided to be the last person person to answer. Reason? I was buying myself time to think about the so-called good answer for that particular question. Pfft! My colleagues gave various good answers and when it was my turn I remembered mentioning about the importance of the teacher to be a role model to students and the 'education' should start from the early level of education; pre-school level. I also mentioned about the relevance of showing the 'graphic' causes of smoking to the students and let the students make inference based on their observation and at the end of the day, it's up to the students to decide; to smoke or not to smoke. Most importantly, teachers should impart good moral values. I did elaborated my answer but I couldn't really recall everything that I said. I was extremely satisfied with my answer though. There were only TWO questions and no questions related to policies or whatnot were asked at all! The interview took us exactly ONE hour. Nevertheless, I felt good about the interview and I believe my other counterparts felt the same way too. We walked out the room with glowing smile! :) And yes, instantly, we were swarmed by the remaining candidates and were asked about what questions were asked. :) To so-called celebrate the 'freedom' from the interview, we all went to treat ourselves a good meal at McD Center Point.